Project SafeCom is a 'community development project', and it is an incorporated association. The people behind Project SafeCom want to do a couple of very important things on a large piece of land, and with a large piece of land. There are two sections to this page: the first section, immediately below this box, was the first-ever implementation vision, written and conceived during 2000-01, and based on generous availability of federal and state government funding for community development, farm diversification, training and education, and sustainable land development, during the Hawke and Keating governments. The concepts laid down in that section of this page ask for implementation - but it was given in the knowledge that no strict timeline was intended to be set in the parameters of Project SafeCom's Constitution. The second part of this page, titled "What is Project SafeCom? ", inside the beige box, clarifies this. The determination of the timeline happens on Committee level, within the context that 'some time in the future' the need to establish such an intentional community, in the context of climate changes and perhaps disasters, will no doubt become evident. The Project SafeCom people do NOT have this piece of land as yet. They hope, that they can buy this land, or that they can lease this land, or that the State or Federal Government of Australia will give this land to them. Or that maybe someone who is pretty rich, will give this land to them. There are a couple of things in Western Australia which make this very possible. Western Australia is the largest State in the world. It also has only about 2 million people who live in the State. With so much space, it is quite possible that they can be given thousands of hectares of land for the project. Are we loopy greenies or hippies? You thought that, didn't you? Let me confess: One member of the Committee says: "I DO feel a bit whacky when I think of making such an ambitious plan for a huge farm without having such a farm. I DO feel I must be nuts even considering planning this. But I also know that I have never allowed myself to be put into a 'box', and I don't like being 'labelled'. That's an educated way of calling somebody names." "When I grew up, there were hippies everywhere in Europe. And while my friends listened to Procol Harum and The Beatles, I was too busy studying the Organ music of Johann Sebastian Bach. The things that were typical for "hippies" in Western Europe, went by without me really understanding what all the fuss was about...."
Can we challenge you? Have a look through the entire Web Site, and then come back to this paragraph, and think for yourself for a minute whether you think we're loopy, whether we're hippies or whether we're Greenies. Don't forget to look at the Steering Committee page and see whether we look like hippies. (The American Heritage® Dictionary of the English Language, Fourth Edition) hippie : A person who opposes and rejects many of the conventional standards and customs of society, especially one who advocates extreme liberalism in sociopolitical attitudes and lifestyles. For now we can state that some of the policies of the Greens of Western Australia reflect some of the things we want with our project, but we have no affiliation with any political persuasion. The Project SafeCom people want to look really well after a large chunk of land in Western Australia. They want to make all the salination go on this land go away, plants tens of thousands of bushes and trees on it, and look after the animals that live on it. They want to run a very large farm on this land, with cows and sheep, with chooks and geese, and with ducks and lambs. They also want to grow a lot of "organic" vegetables and fruit and nuts. They do not want to use any chemical fertilizers if they can help it. They NEVER want to hurt the animals that live on it. ... to develop and implement a property strategy within the strictest guidelines of what constitutes "sustainability", "energy efficient", "organic farming", "permaculture", "non-chemical fertilisation", "nature conservation" and "re-vegetation". Honouring the principles of non-violence needs to extend to animal husbandry. For a few decades now, strong voices have protested and lobbied against animal cruelty on farms and in the food industry. This protest has related to "battery hens", treatment of sheep and cattle during transport - also in the lucrative Western Australian "live sheep trade and export", and the sometimes appalling state of affairs on pig farms. free roaming areas - All animals on the property will be provided with free roaming areas. shelter buildings - Shelters will be built and installed throughout the animal habitats, and these shelters will be insulated to provide protection against Western Australia's sometimes harsh summer conditions, and against winter temperatures, storms and rainfall. animals feel pain - The Steering Committee, in collaboration with the WA Department of Agriculture, Veterinarian Scientists and consultants, will work to implement alternatives in husbandry based on the principle that animals, just like humans, feel pain. researching alternatives - While many implemented practices of this principle are still to be developed, examples of these may be finding alternatives to crutching sheep, cutting the tails off sheep, drenching sheep, branding cattle, and treatment of disease amongst cattle, sheep and poultry. animal welfare before profit - The Steering Committee will hold the view that profits do not come before the care of people and animals, but that any profits are a product of abundance after a 'good season' or welfare amongst animals. Profits and the generation of any profit shall not be regarded as a primary purpose at Project SafeCom, but will be gratefully accepted as a secondary benefit. a decent life - Project SafeCom believes that animals who lead a 'decent' life, will feel differently, will behave differently, and any produce given by them is expected to be of a superior quality. In Western Australia's sometimes harsh outback water is a scarce resource, often only accessible if you can access the underground water resources. There is a vast expanse of underground water under Western Australia. This is called the 'Underground Aquafer'. 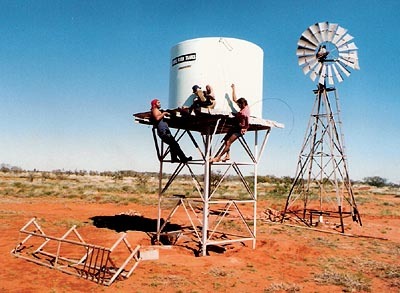 People, especially those people - and farmers - who live in more remote areas of Australia, or in the outback, access this Aquafer by drilling a deep hole, installing a pump or a windmill, and by pumping the water into a tank. This way of harvesting and storing water will not be the only strategy in operation at Project SafeCom. We at the project know too well how precious a resource water is in Western Australia. For crops and trees, use of all strategies in use in permaculture systems. small scale cropping - under directives of the Steering Committee to ensure that the soil at no point in time is dominated by crops for the purpose of profits. rotation of crops - to ensure that levels of nutrients and minerals in the soil will remain in a balanced state. permaculture - application of permaculture methods of soil use, plant propagation and management, including technologies such as 'companion planting' to ensure an optimum balance of the habitat and to strive for a maximum chance of development of a holistic micro-climate. fertilizers - No chemical fertilizers or soil stimulants have a place at the property of Project SafeCom. If in the opinion of the farm manager this policy cannot be adhered to, the farm manager will consult with the property manager, the environmental consultant and the Steering Committee until a satisfactory resolution of this dilemma has been found. We don't believe a word of all the optimistic stories about the great benefits of genetically engineered crops that are doing the rounds amongst governments and amongst some sections of the Australian community. We have the impression that the facts about genetically engineered crops have been more thoroughly researched by Greenpeace than by any Government. It seems clear that the companies who develop genetically altered crops, and who are in the business of selling this product (the genetically engineered seed) for profit, meanwhile - through patenting their inventions - creating a Monopoly, have absolutely no interest in finding out the dangers to conventional crops already present in the world. We believe that ALL crops in Australia are in danger of being infiltrated by stray pollen of genetically engineered crops and infiltration of these plants. At Project SafeCom, we will do whatever we can to keep the property free of this type of infiltration. Our farm manager and our environmental consultant(s) will fight hard, study thoroughly, and inform us fully of the strategies needed to achieve our purpose. According to the Constitution, Project SafeCom promises to be "....a Safe Community in Western Australia for people of any race, gender, creed or nationality, who are displaced as a result of Wars or Political, Social, Climatological, Ecological and Geological upheaval and/or Disaster; and for other users as and when appropriate...."
The full text of the 'looking after people' section can be found on another page on this Site, the people page. You can click through to this page via the menu. The section below is a summary of our plan for just one of the user groups of the facilities at Project SafeCom. our challenge - In a fresh invitation and an open challenge to the Australian Government's mandatory detention of asylum seekers and refugees, the people of Project SafeCom are committed to be open to host refugees. our alternative - Our invitation goes out to the Australian Government to urgently consider alternatives to detention camps. Project SafeCom is happy to host people who come to Australia from any country determined as 'at risk' under UN Guidelines; just that we will NOT allow fences, limitation of physical freedom or the taking away of human dignity and basic freedoms. our giving - At Project SafeCom people who come as asylum seekers are offered to be part of a transient community, to have a space to ground themselves with nature on the Australian soil, they can work with sheep, cattle, be part of a thriving community, learn about Australian ways of dealing with the climate, rainfall, building methods and the heat. our learning - Asylum seekers at Project SafeCom, while they await processing of their legitimate claims under the United Nations agreement of 1951, can enrol in courses conducted on-site, get a place in English language classes under the entry scheme for migrants and refugees, and they can experience the friendliness and larrikin lightheartedness of Australians, and start to heal from what in most cases can be proven to have been lifelong traumatization through the political and social persecution in their countries of origin. Project SafeCom is a community development project and an incorporated non-profit association based in Western Australia. It was established in December 2001. The vision of Project SafeCom is laid out in the constitution in summary form, but in practice this vision provides for a set of ethics, a direction for its values and social responsibilities. The Constitution defines Project SafeCom as having an intent to establish a safe community for people of any race, gender, creed or nationality, who are displaced as a result of Wars or Political, Social, Climatological, Ecological and Geological upheaval and/or Disaster; and for other users as and when appropriate. Below are some comments about the practical implementation of this vision, adapted from a 2007 work areas definition statement. Project SafeCom has marked its values, directions and ethical positioning to refugees, displaced people and various other vulnerable population groups by defining a vision of a rural, farm-based sustainable community in [Western] Australia which would act as a safe community for people of any race, gender, creed or nationality, who are displaced as a result of wars or political, social, climatological, ecological and geological upheaval and/or disaster. By capturing a community vision in this practical way - without stipulating a timeline for its implementation - Project SafeCom has defined its values of adherence to relevant International Conventions, environmental sustainability and, as its logo alludes to, values of care for land and care for people, while at the same time this notion of "intentional community" alludes to what may to a greater or lesser degree become a future community life form and community practice in an era where Australian city life and ecological/societal cohesion and equilibrium may be seriously affected by climate change. Project SafeCom opposes the Australian Government's mandatory detention of asylum seekers and refugees and the restrictions placed on their basic freedoms and sense of dignity. Since its implementation in 2001, Project SafeCom has opened up and refined its contribution to the national debate on human rights issues, aspects of the anti-terrorism legislation, asylum seeker/refugee treatment and policies, and the relationship with Australia's Indigenous people through frequent and impassioned media work, submissions to Parliament, communication with many individual MPs and Senators of all parties and sides of the House and Senate, and through regular community-based events, forums, debates between key stakeholders, and through movies, performing arts events and dramatised readings. It has also represented detained asylum seekers and availed itself as a bridge between their interests and mainstream Australian media, and has been successful in achieving change of circumstances, and release from detention, for several individuals and families, using the method of bringing a previously untold story to the attention of the Australian public as well as the Federal government. Through its online shop it brings relevant literature and movies to the attention of the public while at the same time using these sales as a form of revenue raising to assist its operations. Project SafeCom's highly valued Daily News and Updates, a subscriber-based electronic newsletter, links many people in Australia's Human Rights lobby and sources them with the flood of print- and other media in its relevant mandated areas of refugee issues, anti-terrorism legislation, environmental and climate change policies, and indigenous issues.